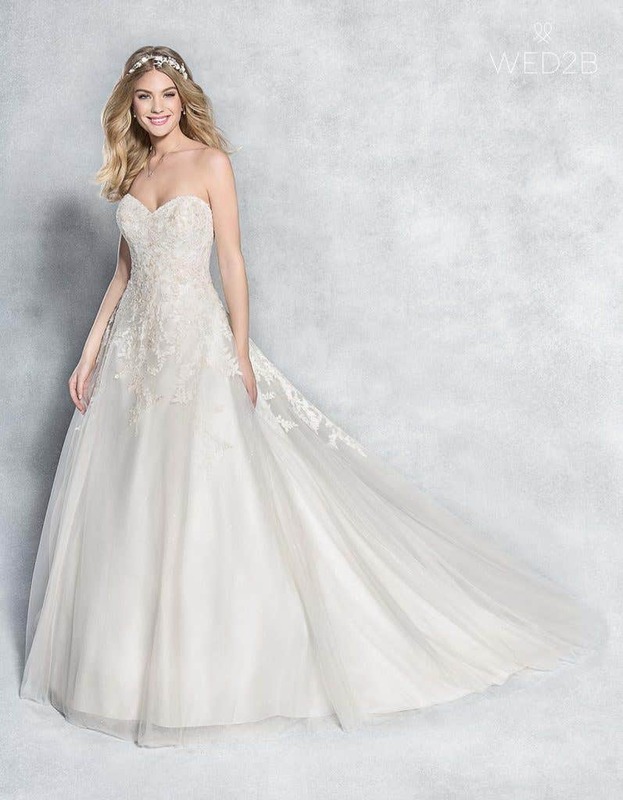 This fabulous A-line gown has a gently flaring bodice covered with beaded lace. The stylish silhouette enhances curves and is a shape that’s universally flattering. Don’t forget to try both colours too, to find the perfect shade! The vintage lace wedding dress trend is big this season and this design is the perfect fit. 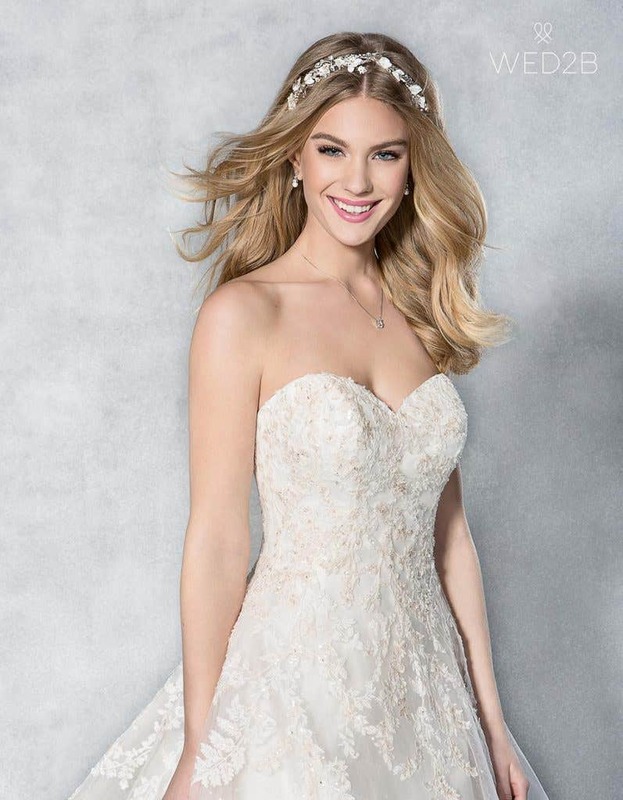 The embroidered lace is oh-so delicate and the sparkling beads add just the right amount of sparkle to the classic sweetheart bodice. At the back there’s more of that gorgeous lace surrounding luxurious ribbon lacing, which helps to give the perfect fit. For a pretty princess feel, this dress looks great worn with tumbling tresses that have been loosely tied and set off with a simple floral headband. The sumptuous skirt ends in more of that beautiful lace. Wear it with our 190 underskirt for even more wow factor as you swish down that aisle. For a similar strapless style take a look at Amanie or, if you’d prefer this look with straps, check out our Louisa dress instead. This fun Viva Bride dress is ideal for brides look for a vintage lace wedding dress. 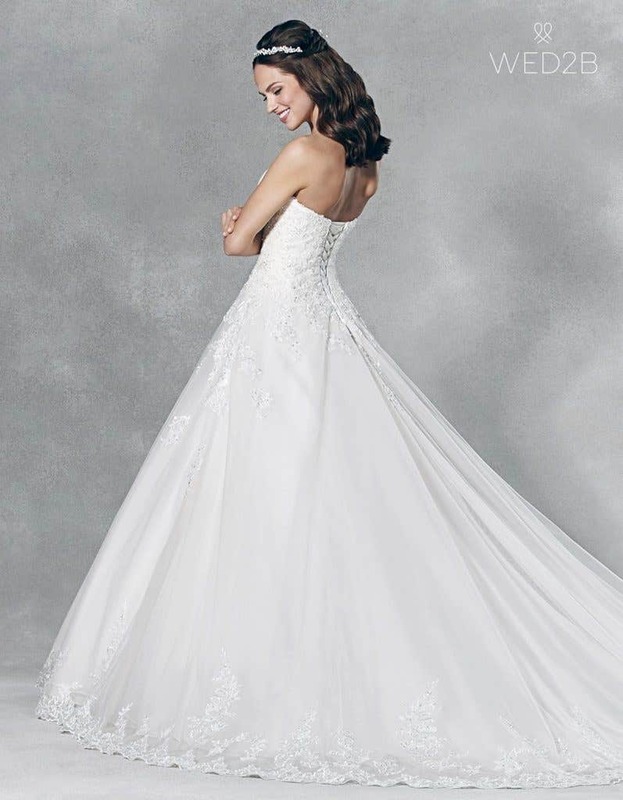 It features a classic sweetheart bodice covered with stunning embroidered lace that trails seductively down the flowing ball gown skirt. Accessorise this perfect princess style with our pretty Autumn headband and a simple pendant necklace. The ball gown skirt also looks fab worn with our 163 underskirt for extra volume and bounce. 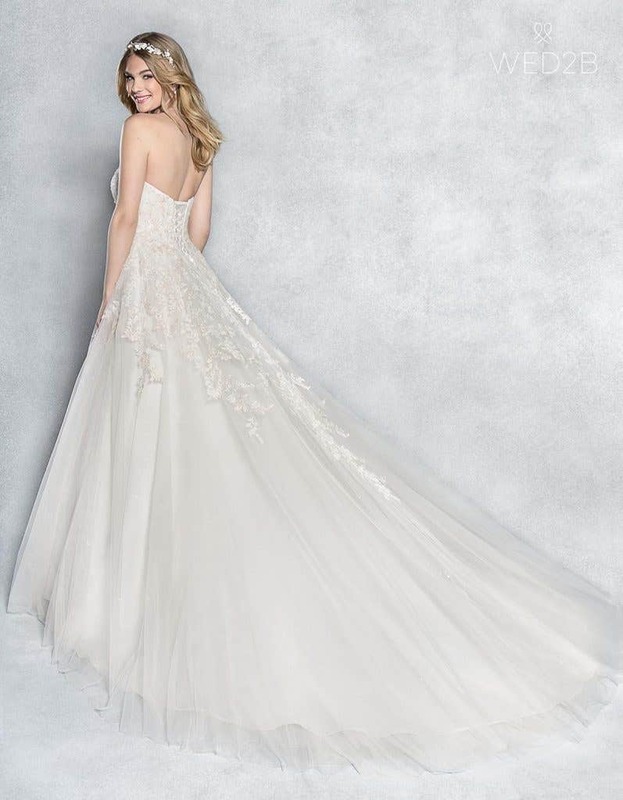 There’s also the sumptuous ball gown skirt, which features more of the lovely lace tumbling down the train before ending in swathes of soft tulle. If you like this look, why not check out Marley and Bethanie too, which have a similar romantic feel? And finally, this softly draped dress, lined with satin and overlaid with chiffon, is a simpler style that’s super flattering. The slim A-line shape creates a smooth silhouette while the draped chiffon perfectly flatters the waist. It wouldn’t be a Viva Bride design without a little bit of sparkle now, would it? Here the glitz is kept understated but stylish, with a smart sparkly appliqué. The careful placing draws attention to the figure-flattering folds across the waist and hips. Turn around and the stylish lace-up back pulls in the waist for the ultimate feminine shape, before flowing out into an understated train. Simple, chic and oh-so stylish! We’ve styled this dress with our 190 underskirt to give the skirt a little added oomph and kept the accessories to a minimum with just an elegant floral headband. If you love this look but would prefer a little more embellishment take a look at our Amanie dress too.